It's no secret that money is tight right now. But that doesn't mean you can't have the luxurious, elaborate wedding you've always dreamed of. It just means that you need to be creative and resourceful when planning your wedding or next event, and trying out a few DIY crafts. I came across JooSweetie, the textile crafts artist on Etsy, and was inspired by her Love Tree ring bearer pillow. I thought the two owls, or more like two love birds, were absolutely adorable and sweet. It seems relatively easy and also fun to make a ring bearer pillow. Whether you are a friend, relative, or the actual bride, handmade touches make a wedding so much more personable. DIY projects, like a ring bearer pillow, make some great gifts and keepsake items too. What is also so great about this is the size of a ring pillow. Since it is so small, you can splurge on that fancy fabric you've been eyeing! 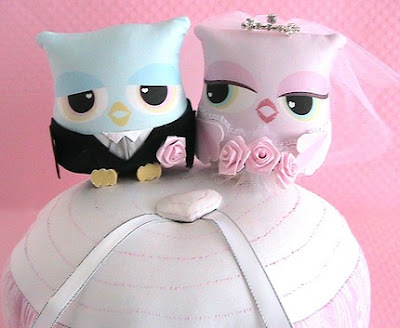 Click here for directions on how to make your own ring bearer pillow, compliments of ehow.com. Be sure to check out JooSweetie's shop where she has many other wonderful, handmade products. If you end up making your own ring pillow, let me know how it turns out!